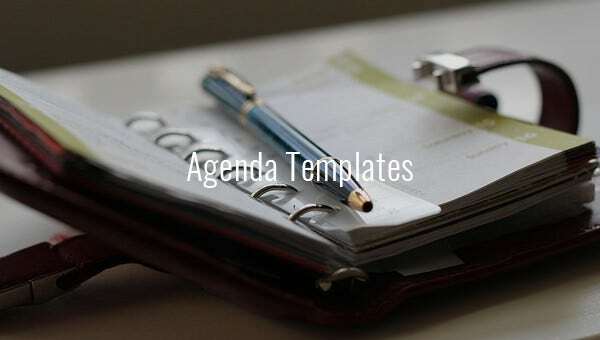 Agenda Template – 24+ Free Word, Excel, PDF Documents Download! The agenda is the most important part of a meeting. You can say it’s the soul of any meeting and without it the meeting has no value. 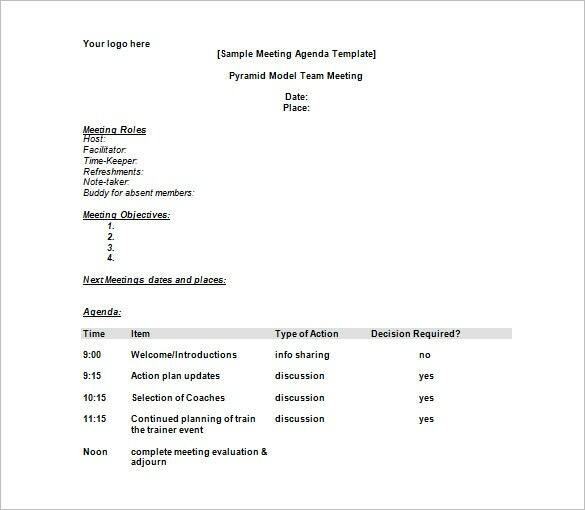 In simple words, an Agenda Template example will include a roster of the different activities to be taken up in a meet. The meeting agenda must be prepared beforehand and should be distributed among the attendees so that everybody can be aware about the theme of the meeting. Business meeting agendas can range anywhere from office relocation to new client acquisition to market expansion to extension of product inventory and so on. 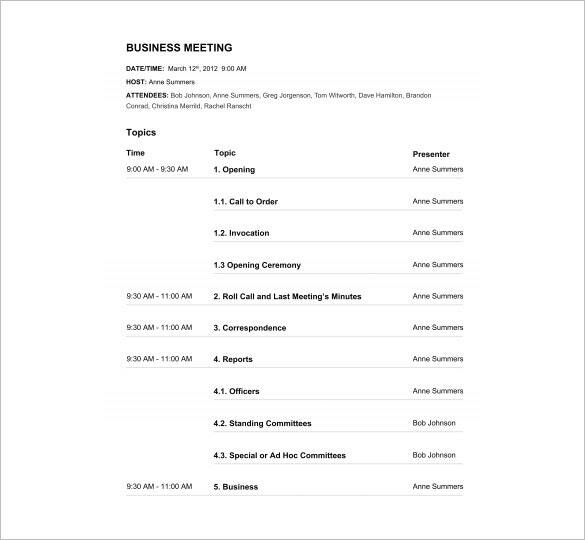 A business meeting agenda template word doc helps to create a neat arrangement for the agenda or agendas to be discussed in a business meet so that participants can be clear about the purpose of the meet beforehand. A calendar agenda template sample is used to clearly specify the activities to be taken up in a specific calendar year. Used by business professionals and students, such templates enable one to stay alert about the projects to be performed and the deadlines to meet to reach the set goal. 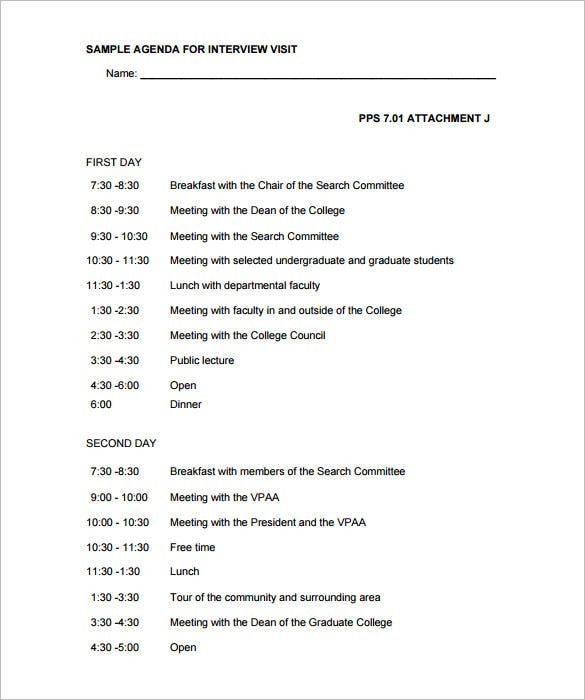 A sample agenda template example is a must have to ensure an organized meeting. It helps the attendees to clearly understand the objectives of the meeting which further enable them to prepare their speeches beforehand as per the specified time in the agenda. The agenda template may or may not include multiple topics for discussion. A project management meeting agenda generally deals with the steps to be taken to complete the project on time and with the needed efficiency. 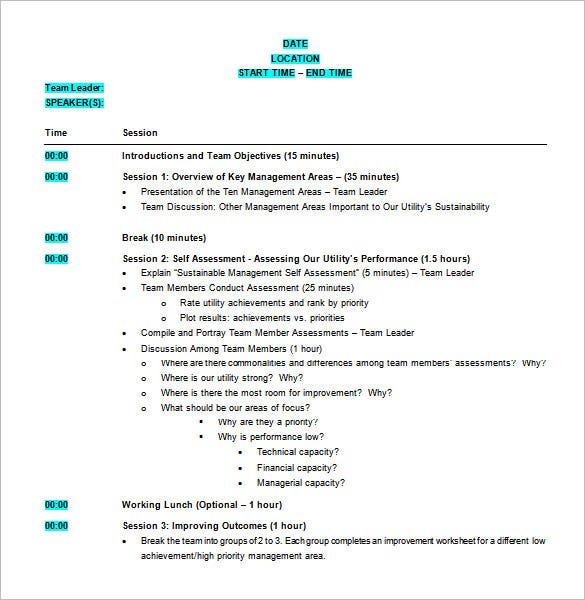 A project management meeting agenda template word doc also specifies the different responsibilities to be assigned to each of the members of the team supervising the project. A board of directors meeting agenda template sample is usually concerned about the important aspects of a company -such as a change in administrative power, new technologies to be introduced for better production, financial statements, progress report of the company, major promotions, hiring of senior executives, compliance regulations or major contracts. Planning an event is an elaborate affair. An event agenda template word doc can be about a new product launch event by a company or a conference to discuss rising issues with eminent business leaders or the annual award function hosted by firms to reward the employees and so on. 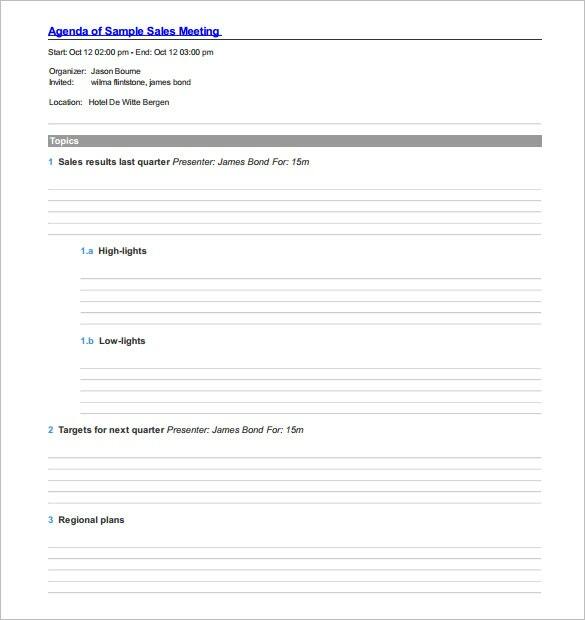 A sales meeting agenda template example usually talks about the sales strategies to be introduced in the upcoming marketing campaign, the improvements to be taken up for the existing strategies as well as personnel to be involved or the sales target to be reached by the campaign within a set deadline. 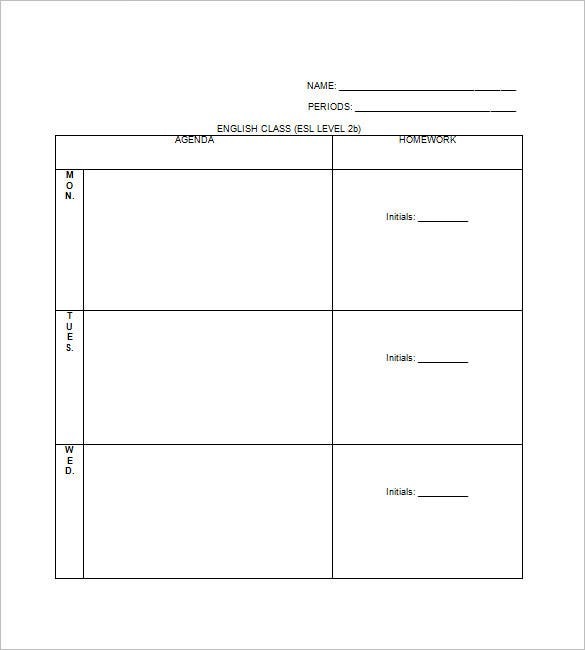 A homework agenda template sample is an important tool for the teachers which help them to assign and keep track on the homework given to students. 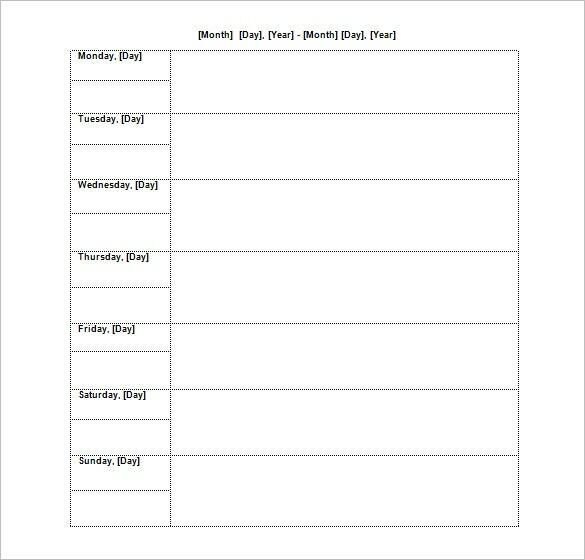 You will find weekly homework agenda templates while monthly samples are also available to be used before month-long vacations. These help the teachers & students to stay organized with the assigned homework. 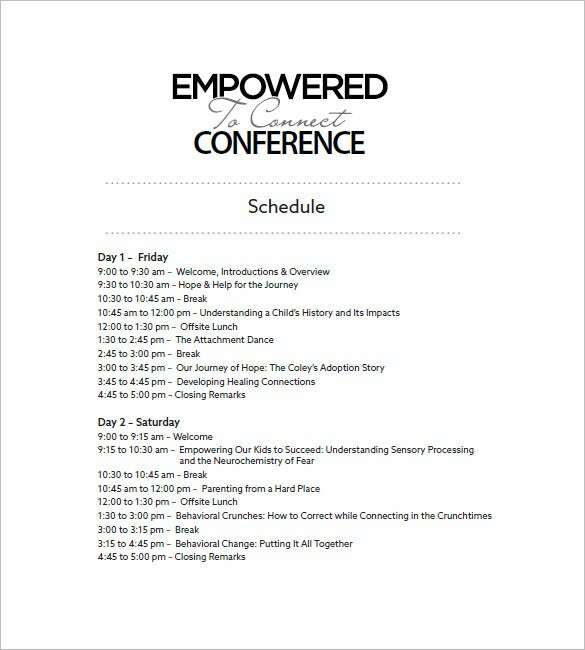 If you are organizing a conference on behalf of your organization, you must stay ready with a conference agenda template word doc. It will help you to arrange the entire program in an organized manner with clear specification on the issues to be discussed, the name of speakers, the time limit for speech and the time of adjournment. The agenda is heart of any meeting and the meet revolves around it. 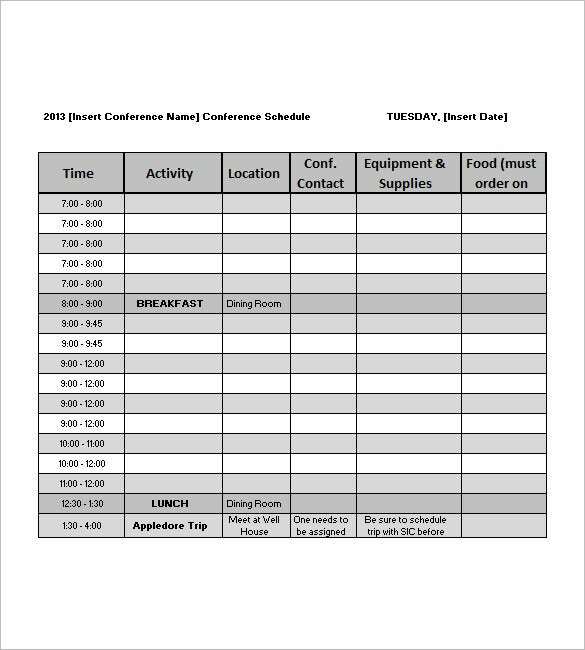 An agenda planner template example helps one to put the agendas to be discussed in a conference or a meeting in proper order so that everything stays organized and clear for the meeting attendees and nothing gets missed out. 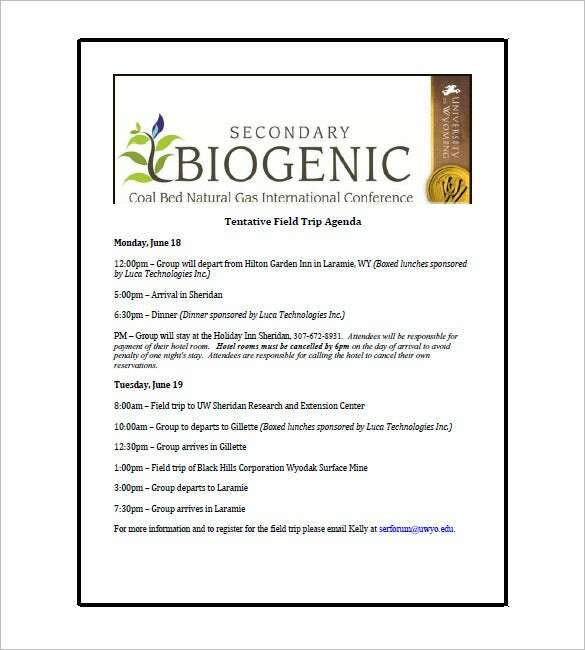 A trip agenda template sample is very necessary for an organized planning and execution of a trip. It covers topics like the destination of the trip, the people to be met, the activities or strategies to be implemented during the trip, the budget, the start date as well as the return date of the tour. 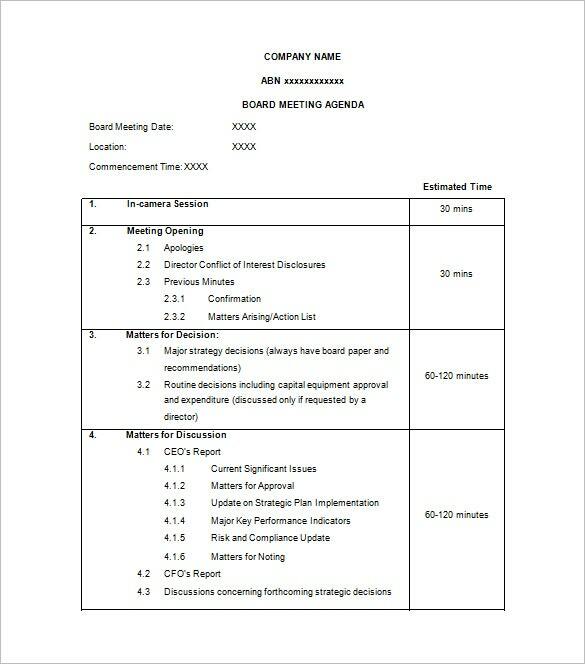 For a meeting to be effective, the agendas should be specified in proper order and this is where an effective meeting agenda template word doc comes in. 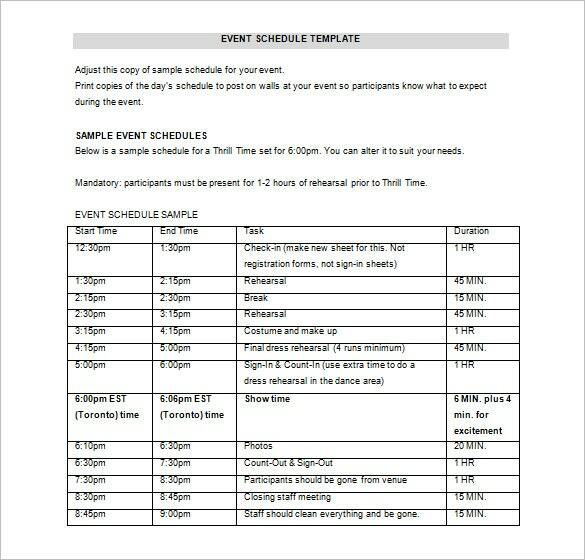 The template will help you with a readymade customizable agenda framework so that you can arrange all your agendas in order and distribute them for the attendees. A strategy meeting agenda template word doc deals with the different strategies to be taken up for a new project as well as the improvements to be made in existent strategies. It could mean strategies for sales, marketing or company administration. You will be able to avail readymade word doc download for free. 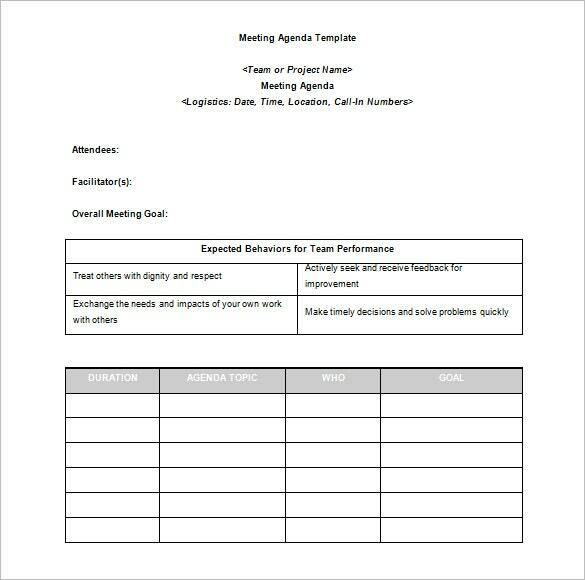 A business agenda template example is helpful for any meeting to be held in a company. It could be about how to increase ROI through innovative sales techniques or the mediums to be used in upcoming marketing campaigns or recruitment of a CEO or how to rectify compliance issues and so on. Planning a wedding is no doubt an elaborate affair and a wedding agenda template sample is a really useful aide. It helps the party planner to keep tab on all the major agendas of a wedding party ranging from the bride’s dress to the party timetable, venue, catering, guests, invitation card etc. Recruitment of potential employees is a huge thing for the employers as their decision here can make or break their organization. 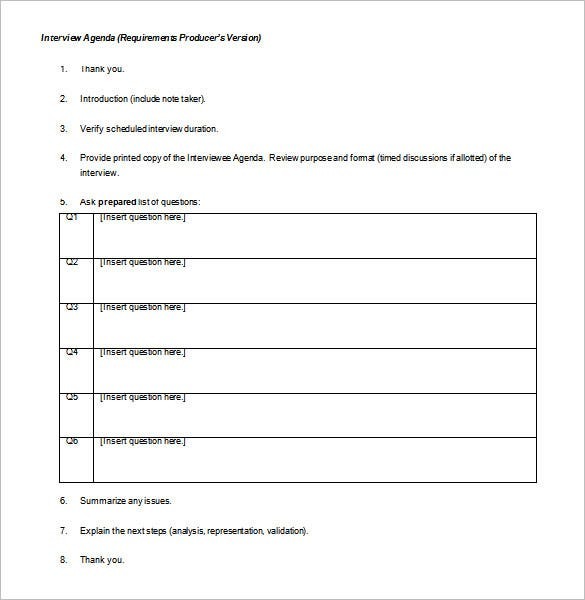 Thus, the employers should always be ready with an interview agenda template sample beforehand that will help them to decide how to and what to question the prospective job applicants. 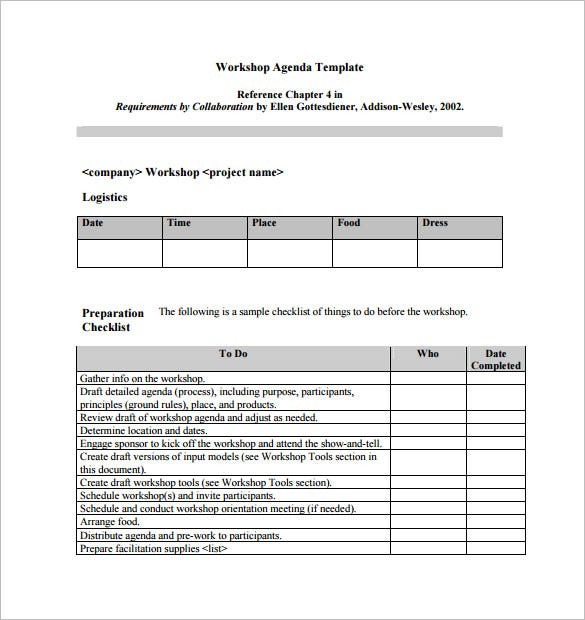 If you are planning to organize a workshop soon, be sure to stay ready with a workshop agenda template example. It will help you to clearly note about the need of the workshop, the skills or strategies to be taught at the workshop, the duration and number of instructors and students to be involved.